The official Disney Alice site has a lot of new stuff on it, including enormo-vision versions of the teaser trailer that was released yesterday, and a synopsis. There is also a way to sign up with Disney for news (click on the hat), although I don't think that's specific to Alice in Wonderland. The Leaky Cauldron Lists Harry Potter actors who will be appearing in Alice 2010. I had known about Severus Snape (Alan Rickman), but hadn't put Bellatrix Lestrange on my list (silly me), also there is Wormtail (Timothy Spall). The completeists out there should add: Stephen Fry, the UK Harry Potter audio book narrator. 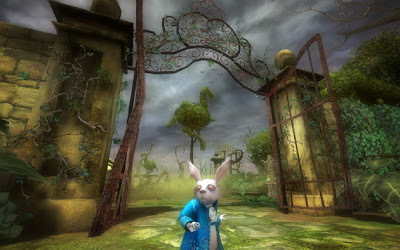 Disney Announces Alice in Wonderland video game which will be for the Wii, Nintendo DS and Windows PC. Many other sites expressed their disappointment that it wouldn't be a port of American McGee's gothic Alice game to the Wii platform. Rotten Tomatoes covered the Disney segment of Comic Con 2009 which happened yesterday, and which included a visit from Johnny Depp.